Overall, the Exynos 7420 beat out the Qualcomm 810 in pretty much all of the tests within Antutu benchmark app. What we wanted to really find out was the heating issues with LG G Flex 2, which causes the phone to lag when playing games for a long time or using the phone in very hot weather. 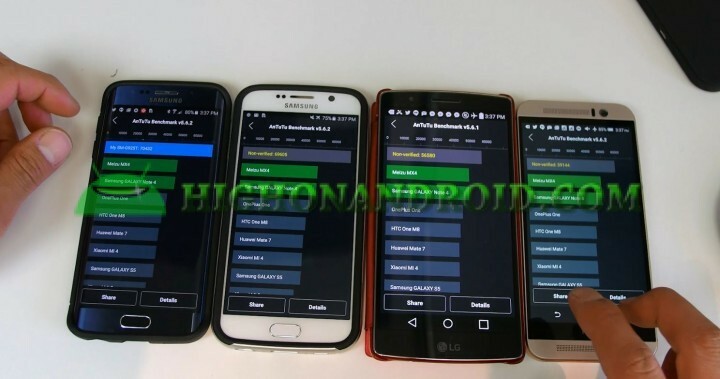 Actually, both HTC One M9 and LG G Flex 2 did quite well up through 3 Antutu benchmark tests. On the fourth test, the heating issues appeared with the LG G Flex 2 while the HTC One M9 had nearly identical results for all 4 tests. We’ve isolated the problem happening only to the LG G Flex 2, which means that LG’s software implementation (specifically their kernel) is at fault. And the good news is that HTC One M9 does not have these issues, at least in benchmarks. However, if you are having any of those issues on your M9, please be sure to tell us in the comments box. The good news is that LG should be able to fix the heat bug with the G Flex 2 in the upcoming software updates and Qualcomm 810 processor may be not bad at all. And as far as the performance of the two processors, the Exynos 7420 clearly wins outright. Also consider that the S6 and S6 Edge are running 1440P screens while the HTC One M9 and LG G Flex 2 are running 1080P. Since higher resolution displays take up more processing power, we really need to add 5000-7000 more benchmark points to the S6/S6 Edge to compare fairly with numbers to the M9/G Flex 2. The results? Yeah, the S6 and S6 Edge kills both HTC One M9 and G Flex 2 by at least 20,000 points or roughly 36% faster performance. Antutu is probably one of the most accurate benchmarks out there for Android devices in general but we will definitely do more testing, feel free to suggest any of your favorite benchmarks in the comments box, thanks! Previous story How to Disassemble Galaxy S6 Edge for Screen Replacement!